When I was quite young I have distinct memories of visiting my grandma who lived in Oregon and in her home where she lived from about 1915 was this very cool player piano. I would spend hours pushing on those pedals and watching the magic of the keys going down to produce that delicious old player piano sound. Many of the rolls I enjoyed the most were performances of ragtime pieces composed by the KING of ragtime: Scott Joplin. Later in life as a young college student I would regain my interest in Joplin and acquired his complete works. I recall my mom being in the living room sitting down crocheting and listening to me play and would as me to play another and another. I thumbed through the book and fell upon this piece called The Heliotrope Bouquet and almost as soon as I began playing it my mom called out. . “That was one of the rolls that grandma had”! I said, I thought it sounded familiar. 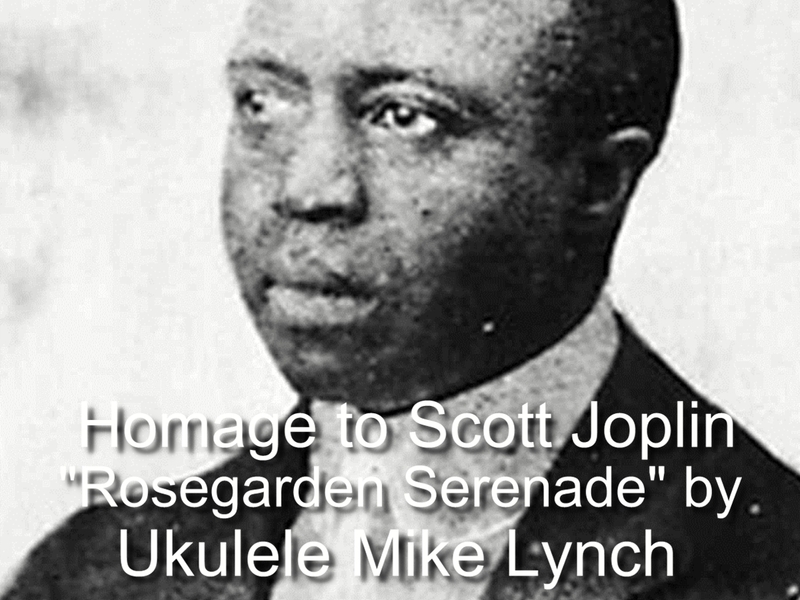 . . and sure enough Scott Joplin was writing these classic rags around that very same time that grandma moved into her farm house down along the McKenzie River in Oregon state USA. Playing that song brought back memories of that quaint player piano sound and I came to love Joplin’s music even more. One day while improvising on my ukulele I sort of heard that piece in my head and began to compose a similar piece and in a way I was chanelling Joplin. He always admonished players NEVER to play ragtime fast. So my approach to The Rosegarden Serenade became that of a slow rag . . Below is a you tube video performance. Take a few minutes to listen . . . .
One element that is found in this short clip and truly throughout the piece is the rhythmic figure of a dotted 8th note followed by a 16th note. Long Short Long Short. . . This is identified as a “swing” rhythm and you can find this rhythm in veritually every ragtime composition. I’m playing this piece with the thumb playing the 4th and 3rd strings, the index finger playing the 2nd string and the middle finger playing the 1st string. Another element would be the parallel shifting of chords up and or down such as at the end of the second measure, or in the triplets. I designed this piece on a high G tuned ukulele so a slight modification needs to be made to correct that pitch difference. On the 2nd beat of the first measure notice the 2nd fret on the 4th string is played. . . That works fine with a High G tuning but if you have a Low G you need to alter that note to be 1st string open. See below a video which more fully describes the contents of this collection . . .